“Hello, Bozo.” It’s charming enough when a game greets you every time you load it. It’s even more endearing when you can choose to be called, instead of your first name, a gently satirical nickname like Bossman, or Chief or, indeed, Bozo. The announcer sounds like she’s almost laughing whenever she says it, like it’s our little shared joke. So we’re proud to be a Bozo, and we feel welcomed. Immediately, from the second it’s loaded up, it’s clear that the good-natured personality of this racer is a far cry from its ever-frowning contemporaries. GRID totally understands the importance of presentation. While other car games, especially those with any leaning towards accurate simulation, content themselves with being an accurate racing model and leave it pretty much at that, this smiling semi-sim paints a little flair onto even minor details. Such touches could be accused of superficiality, yet they make a colossal difference.Sometimes this is pretty subtle - your advisor makes worried noises about the famed abilities of another racer and suggests you aim for third place. The hell you will. Just that casual mention creates an instant, single-serving rival, granting nebulous personality to one of the 15 otherwise faceless drivers - you don’t know anything about him, but you do know you absolutely have to beat him. There’s no benefit to doing so except pride, and every time that’s more than enough. You’ve beaten someone you were told you couldn’t beat. Go, you! But other times it’s not so subtle: come the finish of a successful head-to-head race, you’ll see your name in giant, gold 3D letters hovering over your car, with the word WINNER triumphantly below. The other guy? LOSER. It’s enormously tacky in principle, but in practice it makes for a punch-the-air moment. It helps that GRID’s a remarkably good-looking game. Don’t pore too closely over the individual details, or you may sneer at the mannequin crowds, the slightly too neatly shaped debris, or the mucky textures on the drivers’ overalls. Instead, look wide-angle at the business of GRID’s world - the sheer number of people in those crowds, the side barriers that crumple and disintegrate spectacularly when you hit ’em, the gorgeous reflections and dust-spray from each car. Underneath all its frills, GRID might be a relatively familiar experience, but its gloss and cheer expertly free it from the odd sterility of a GTR, a Project Gotham or even a Colin McRae DiRT (a game with which GRID shares an engine, but discards its infamous chug - this runs incredibly smoothly). It’s here to entertain, not merely to court solemn nods of approval from ardent motorsports enthusiasts. And yet it’s a conflicted creature. I’ve been following the internet response to the demo, and most people’s comments fall into one of three camps: a) too arcadey; b) too hard; c) mmm, the baby bear’s porridge is just right. It’s certainly a tricky game to define - all its trappings, that bombastic presentation, suggest an arcade game, something chasing at the unhinged glee of Trackmania. Then, on the track, the handling is surprisingly demanding, being almost inaccessible to someone without a ton of experience. There’s essentially zero help for new players; even the optional on-screen racing guide line or driving school found in far more stentorian contemporaries are absent. Gruelling trial and error may get a greenhorn so far, but there are fundamental, non-intuitive principles, critical to success in even the earliest stages of the game, that GRID simply assumes you already have. Seasoned racers won’t even notice, of course. They can jump right in, not even blinking at the startling power of the supercars the game kicks off with - glad, in fact, that they get an immediate taste of the good stuff rather than being stuck with slowpokes for ten hours. 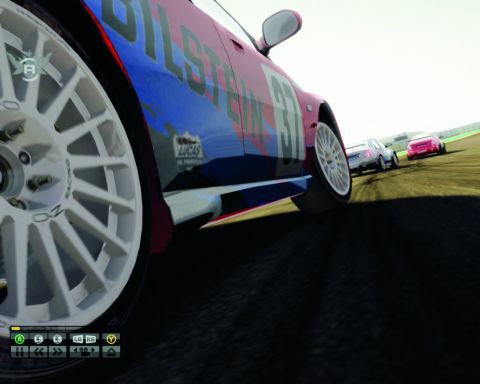 The first four or five races are essentially hired work in other people’s cars so you can earn enough to afford your own vehicle. Description While it's not a huge upgrade from its fairly recent predecessor, Race Driver: GRID is an excellent racing game fans of the genre should definitely check out.